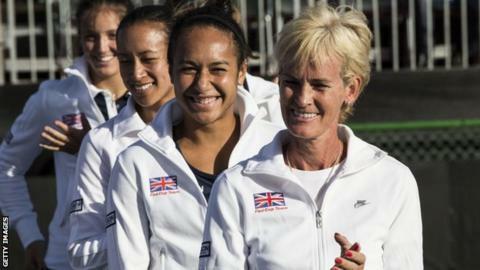 Great Britain's Fed Cup team beat Bulgaria in Israel on Sunday to come through the Euro/Africa Group and qualify for April's World Group II play-off. A victory there would take them into the top 16 nations in the world in 2014. Thanks to a fabulous effort from the whole team we've earned the chance to win a place in the World Group, and it's a huge opportunity for British women's tennis. The structure of the competition means that if we'd lost to Bulgaria on Sunday, that would have been the Fed Cup over for us for another 12 months. But we've managed to get ourselves a World Group play-off for the second year running, and I think we're now ready to compete at that level. We have two players ranked around 40 in the world in Heather Watson and Laura Robson - they've made huge strides forward in the last 12 months and, although they're young and inexperienced in terms of the Fed Cup, they're playing at a high level. They not only play great tennis, but they're also great personalities, lots of fun and good role models who can attract more girls into our sport. Who knows how far they will go but they make tennis look fun, exciting and glamorous. They can keep women's tennis in the public eye. And it's not just those two as we have strong back-up in terms of Elena Baltacha and Anne Keothavong, who have nearly 80 Fed Cup ties between them, along with newcomer Johanna Konta, who is 21, made her debut in Israel and is very much on the way up. So we now have five players, and you need that because there's nothing worse than having one star player who can then get injured. That strength in depth will be vital in April, and in the World Group if we make it through, because it's quite a different format. Rather than the two singles and one doubles format in the Euro/Africa Group, in the play-off or World Group you have four singles and a doubles across two days. The strength of the team, and of your number two player in particular, really comes into play. We were a little unfortunate against Sweden last year because Elena Baltacha had been so magnificent for us in Israel, but she hurt her foot just before the tie and was out for three weeks. When she played at number one in Sweden she wasn't quite as sharp as she could have been. So it's very important to have your top two singles players fit because they're going to be playing four matches, the meat of the tie, between them. We will all be waiting nervously for the draw on Wednesday because we're absolutely desperate to have a home tie - Britain's first for 20 years. Whoever we get, it would be fantastic to play in front of the home fans and use the occasion to promote the team and showcase our sport. There is a job to be done to get more girls into the game, but to retain them we need more female coaches because they understand so much better the needs of girls. When we played in Sweden we took four female coaches to observe the team, get an awareness of standards, the event and the level of preparation that goes into a Fed Cup tie. I think it's very very important we increase and strengthen our female coach workforce to retain girls in the game for much longer than we do now. My immediate task is to concentrate on April's tie, though. Once we find out our opponents, I'll have a look at their likely players and the tournaments they're entered in, and make sure I go and watch them, get some videos and do all the analysis we can. This is the one event when the whole country can get behind the British women and, after getting so close last year, we're determined to finish the job this time.